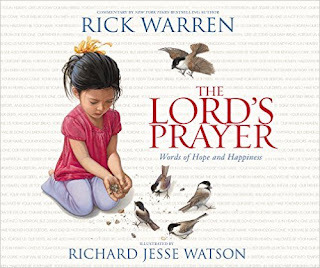 The Lord's Prayer: Words of Hope and Happiness by Rick Warren is a fabulous book for kids! I love that The Lord's Prayer: Words of Hope and Happiness by Rick Warren rejuvenates the familiar prayer for a younger audience. I also love the use of poetic scripture from the King James Version and how well it helps familiarize children with real biblical text while also making this beautiful prayer come alive. The illustrations throughout this book are beautiful and pair perfectly with the words on the page. My kids absolutely love this book and I love that it's helping them learn this beautiful prayer! You can find The Lord's Prayer: Words of Hope and Happiness by Rick Warren on Amazon, Barnes and Noble and other bookstores.